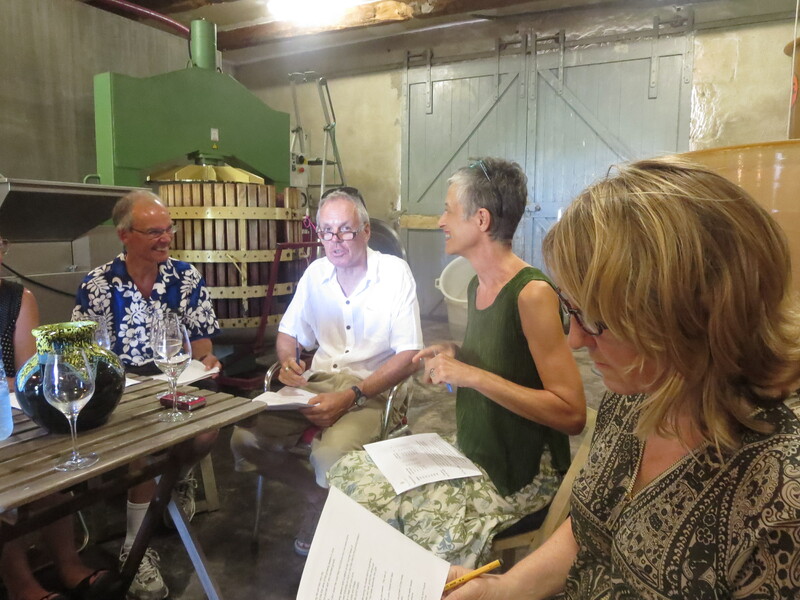 Deborah and Peter Core have been making wine in Caux (34) for 10 years, a cause for celebration. I was truly honoured to be invited to share their celebration evening with a vertical tasting of their Carignan led wines and a dinner held in their cave and garden. Present were luminaries such as Rosemary George, Michel Smith, Andrew Jefford, Catherine Roque of Domaine Clovallon, Gary Voss and Annette Atkins of Voss Estate in Martinborough, New Zealand along with Helen Deneuve who works for Coteaux Du Languedoc and other wine groups and is a good friend of Deborah’s, as well as Wendy Gedney, owner of Vins en Vacances, a wine tours company, Christopher Gallaway, wine expert and Bernard Degioanni, wine and food journalist, so it was a true privilege to be amongst their company. 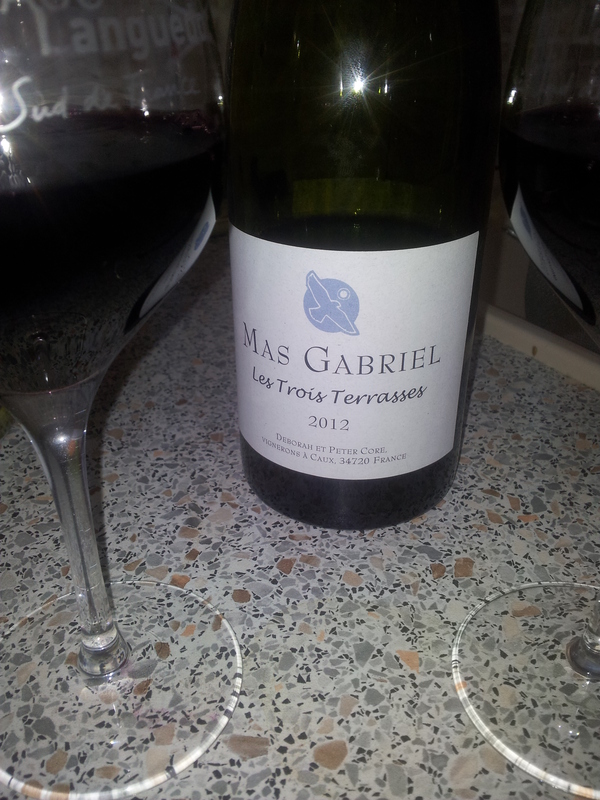 Mas Gabriel has long been one of my top Languedoc wine domaines and I have purchasing from there over many vintages. I have huge respect for the Cores who gave up successful careers in London in law and finance to follow their dream of making wine. 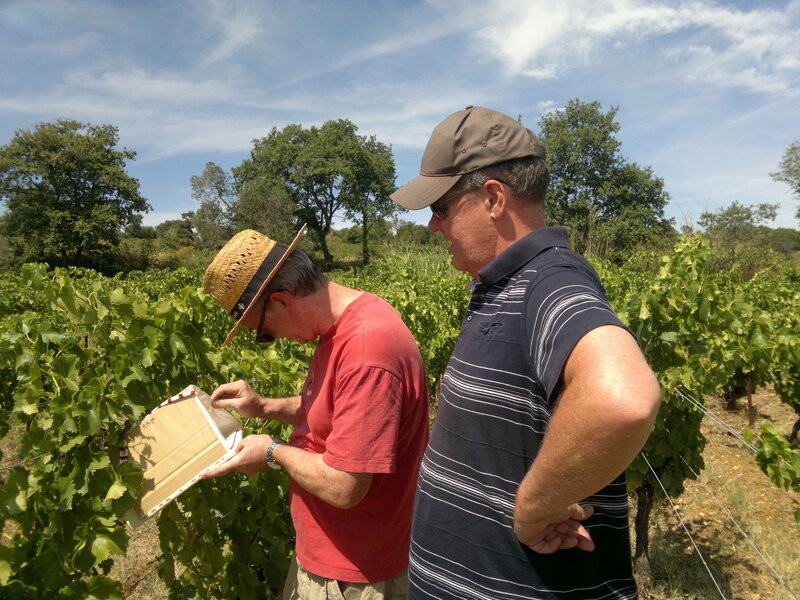 Having trained and studied in New Zealand and France, they decided on the Languedoc as the region which would offer them what they were seeking in making their wines. Land was bought around Caux and the work began. What courage to embark on such a venture and the going must have been immensely difficult at times in the ten years which have followed. Learning about your vineyards, making wine in different vintages, mastering the bureaucracy in a second language and, not least, finding markets. That they remain so passionate about their land and wines whilst being the most courteous and charming people is testament to two people of strength, determination and talent. 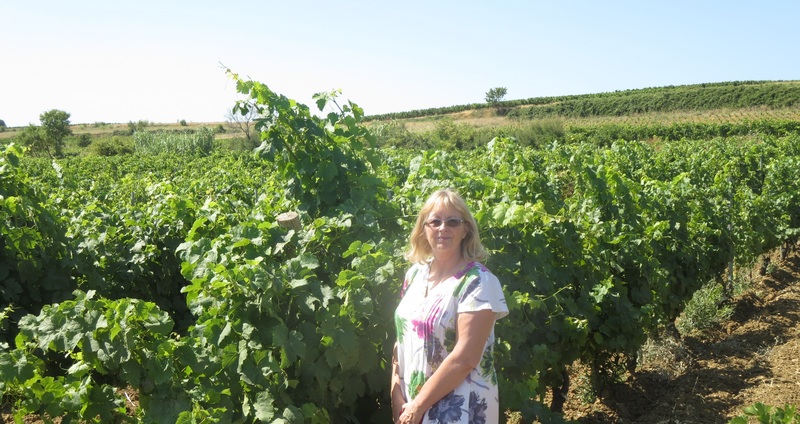 Their wines are produced organically, indeed biodynamically, and are marked by freshness and fruit. We gathered in the cave for the tasting and began with a flight of 5 vintages of Clos Des Papillons, the white wine of the domaine (though joined by a new white cuvée in 2014, Champ Des Bleuets). Papillons has long been one my favourite white wines of the region so this was a special treat for me. Until 2014 the Carignan was given a small 5% addition of Viognier but in 2014 the Cores changed this to 15% Vermentino. Around a third of the Carignan Blanc is aged in acacia barrels to add a little complexity without oak flavours. 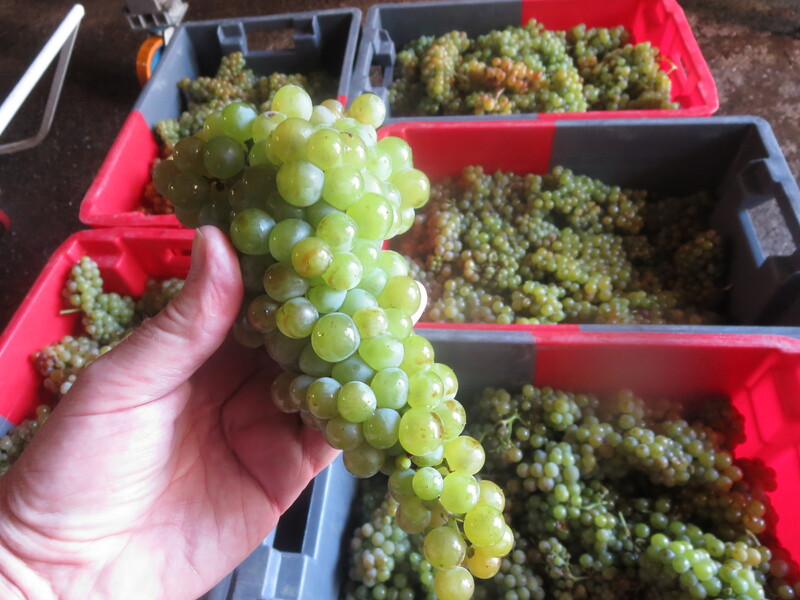 There is no malolactic fermentation as they seek to reflect the freshness and natural acidity of Carignan Blanc. When the wine was first made yields were tiny at 12 hl/ha but much work and even more cow manure has helped to boost yields to 20-25 hl/ha. 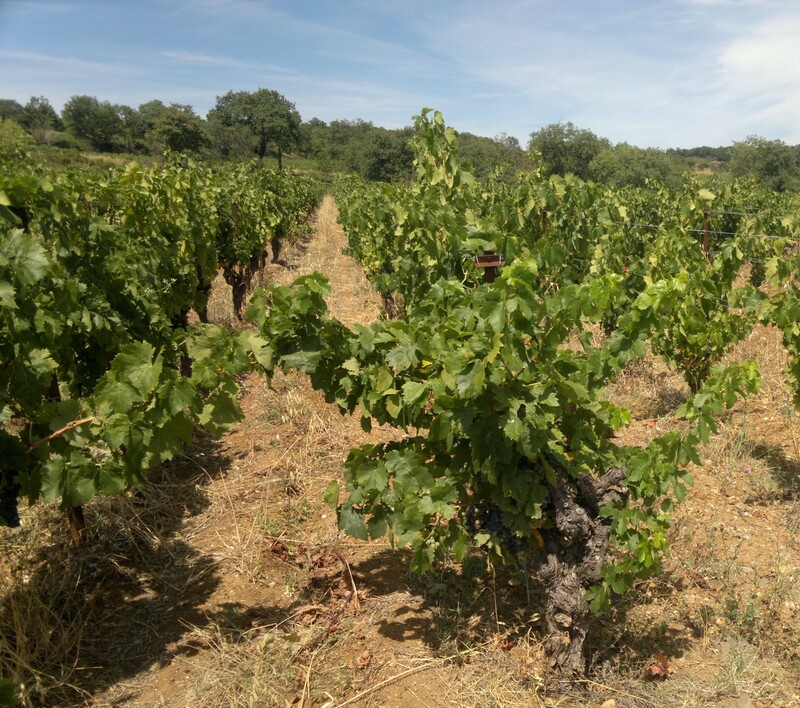 There are only around 0,4ha of the vines (more have been planted) and this is a variety with only about 40ha in the Languedoc so Mas Gabriel has around 1% of them all. 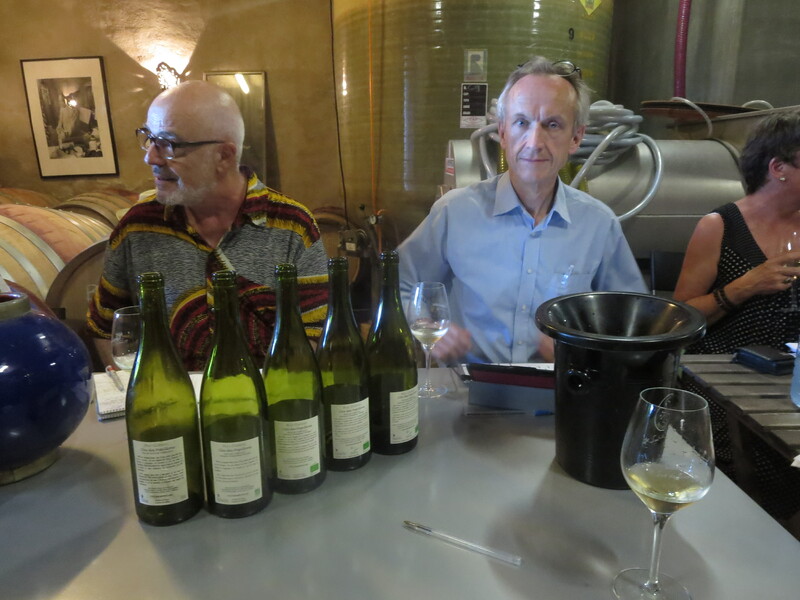 Peter and Deborah actively sought out the parcel after tasting the Carignan Blanc of neighbour Conte De Floris, who does make excellent wines also. The parcel they found is made up of 40 year old vines in gobelet on a sandy, limestone soil. 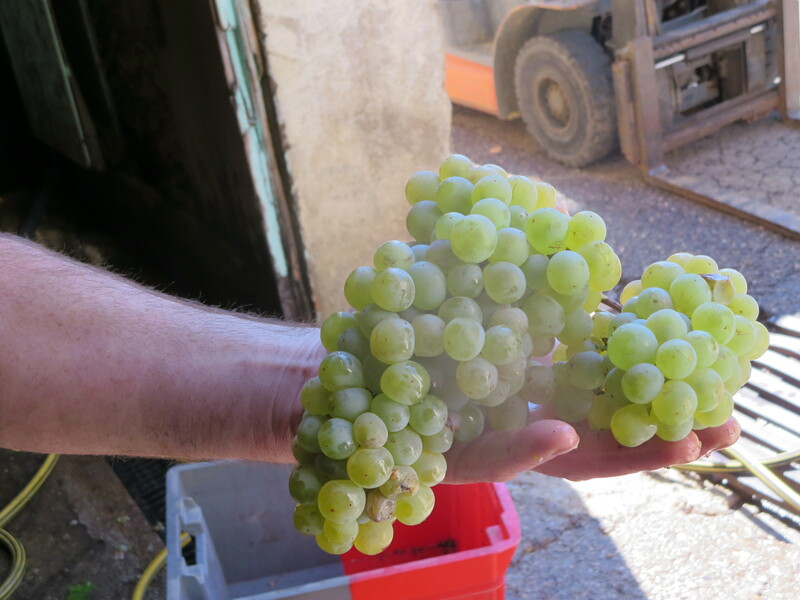 2014 – The first Clos Des Papillons with 15% Vermentino, which is grown in soil with galets, large round flat stones. The wine is very young still and a fresh, lively aroma is matched by a dry, very mineral initial taste. Fresh, fleshy fruits then fill the mouth to round out the dry core of the Carignan, like a peach with the fruit around the stony centre. The Vermentino certainly appears to provide that fruity roundness though the Carignan was slightly less acidic than usual in 2014 too. The wine comes together to form a lovely, refreshing, clean taste. It is very young, it will fill out further and I really like it. 2013 – A big rush of freshness leaps from the glass. Green and yet apricotty. It settles down quickly and lovely fruity, dry aromas emerge. 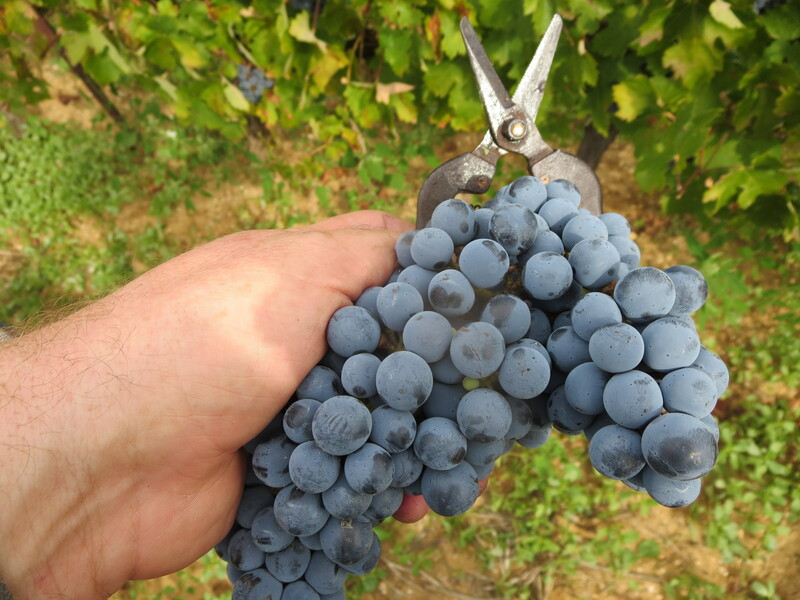 The harvest was quite late in 2013, September 16th, so the nights were fresher as the grapes reached the optimum ripeness, and this is reflected in the fruit itself. Huge flavours of yellow and white fruits mixed with fresh acidity – always in balance, always with a delicious tension. Lovely, a very good wine. 2012 – Yellow, almost light golden in colour. I could detect a little more evidence of wood on the nose but nothing out of balance and it provided yet more complexity, there was no obvious taste of wood. The acidity appeared less obvious, though it was actually a lower pH than usual, the result of an extra year in bottle? Juicy, yellow fruits, with an edge of citrus and agrume. Stony, clean and delicious. I smiled in relief that I have resisted temptation and kept a bottle or two of this vintage, excellent. 2011 – Woh, what a nose, almost ‘Riesling’ in character with hints of kerosene. Happily, Wendy Gedney agreed with me, it’s not just me! Full flavours, lingering lime and lemon fruit flavours add that delicious freshness, definitely more so than 2012. Long, refreshing, balanced, poised! 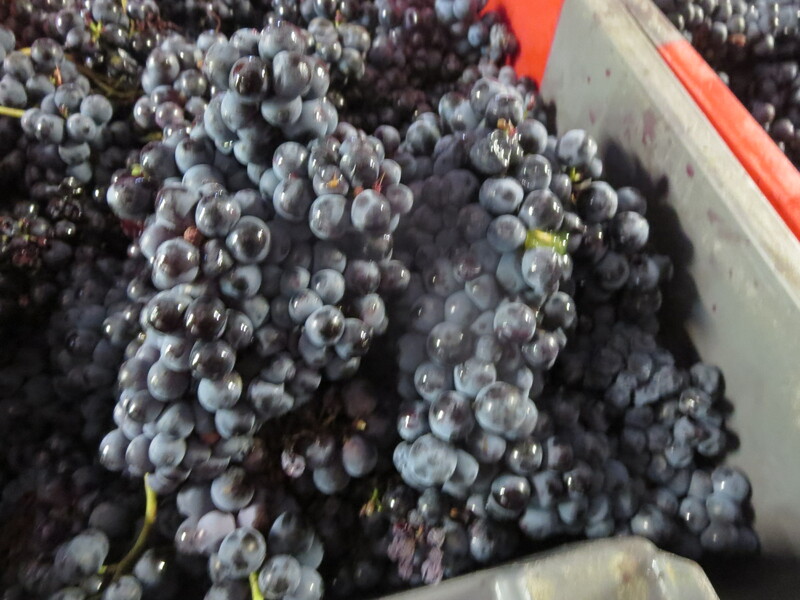 This was the earliest picked vintage (August 24th). It has years of life ahead if anyone still has a bottle (sadly, not me). I loved this. 2010 – Lively, this is certainly not on a downward slope, far from it. Still a yellow/green Starburst citrus edge. 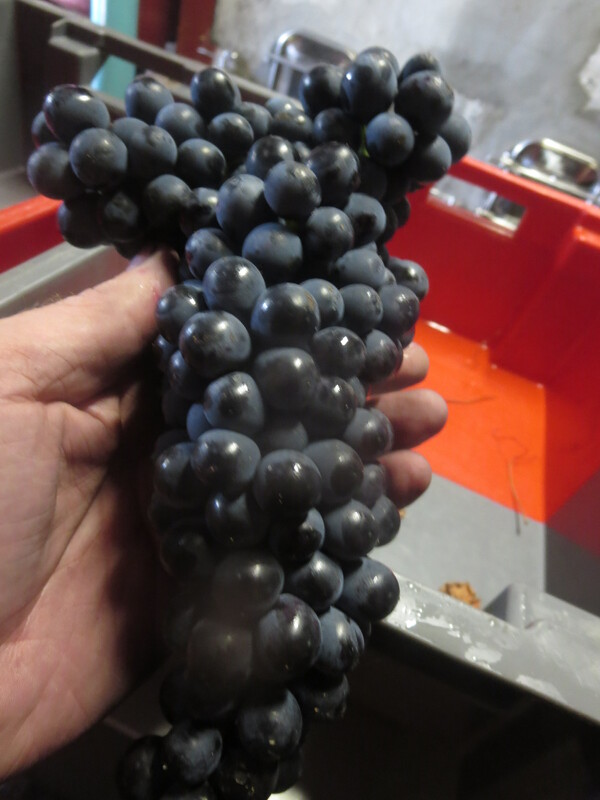 the highest acidity of any of the Carignan vintages yet the wine has rounded out a little. There is a saline, mineral edge in there too but then as you drink (and I did drink some!) an almost waxy, oily finish which helps to coat the mouth with the yellow and white fruit flavours. Lingering, clean and lovely. Clos Des Papillons ages well, no question about it. The freshness and acidity surely help this and whilst difficult to resist drinking in a year or two I am now determined to hold back some bottles. 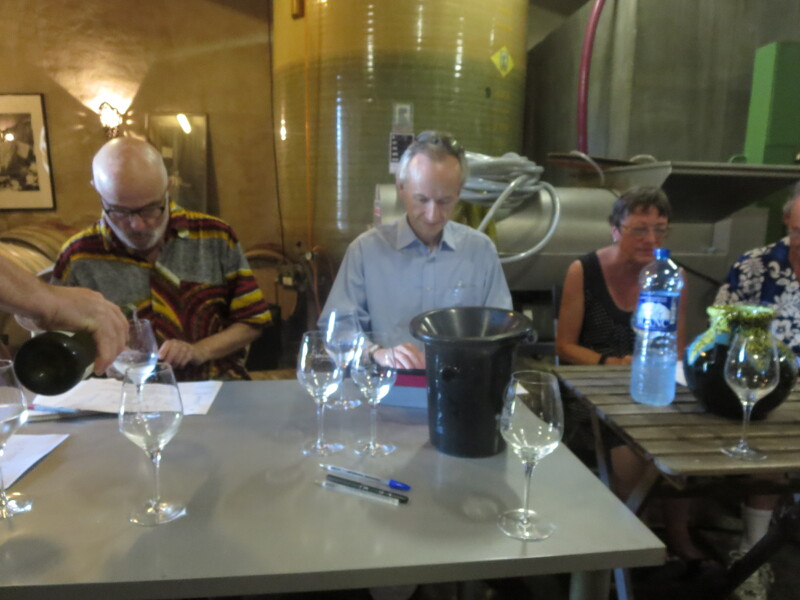 Interestingly, Andrew Jefford was slightly less in agreement with most and would welcome some malolactic fermentation to round out the flavours more. For me, I love it as it is. To choose one vintage? I really like them all, there is nothing here to which I would not give at least 4/5 on my personal scale. 2011 perhaps but maybe 2013 just wins with the freshness, sorry Andrew. So to Trois Terrasses, the first of two red wines made at the domaine, the other being Clos Des Lièvres, a Syrah led wine which is bigger and more powerful, and also excellent I hasten to add (deserved Gold Medal winner at Millésime Bio this year). The first two vintages in 2008 and 2009 were 100% Carignan but in 2010 came a change with 20% Syrah and afterwards up to 30% of the wine is Syrah and Grenache. These are vinified separately in cuves, the Carignan cuve being cement the others fibreglass. 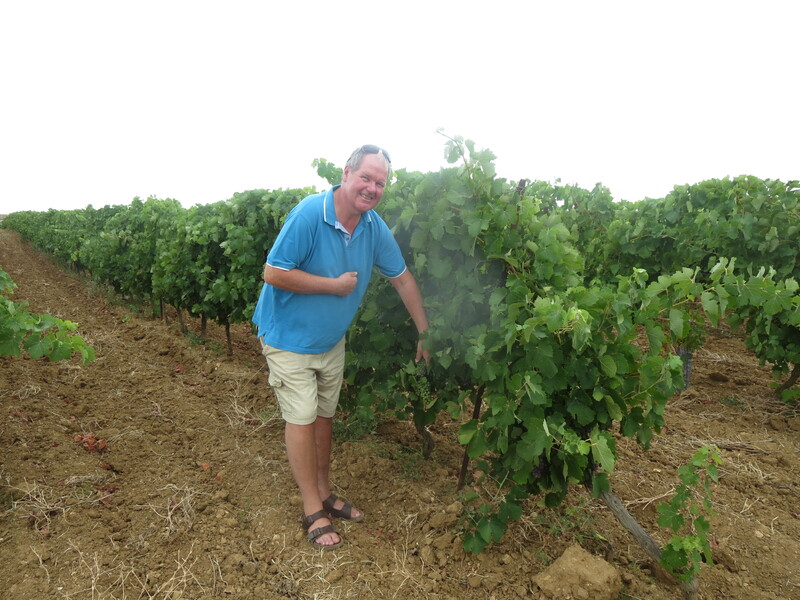 Peter explained that yields of the Carignan were only 10 hl/ha at first but they have built this up, with more hard work and cow manure, to 25 to 30 hl/ha on average. This is reflected in gradually lowered alcohol levels in the Carignan with slightly higher acidity. 2013 – Slightly reductive at first but that blew away within a few seconds to leave a torrefacted nose with plummy, dark fruits which carried over into the flavours along with those coffee notes. There was an almost citrus freshness on the finish refreshing the palate. Spicy, peppery notes developed too and though this needs a little time yet, it is already good and will grow into something very good in a couple of years. 2012 – Rounder, darker, deeper. Complex nose of dark fruit with freshness evident even on the nose. 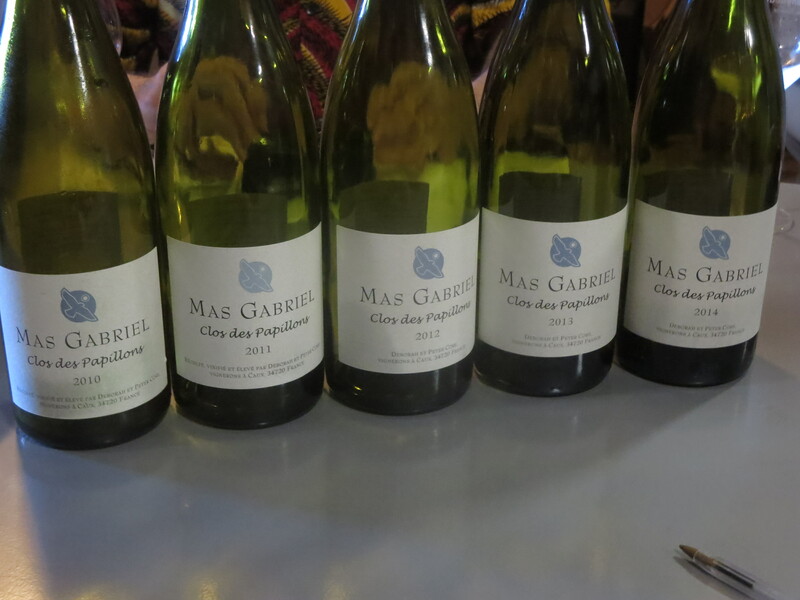 Full in the mouth, rounding out with lots of fruit and minerality and always the trademark freshness which I love so much in Mas Gabriel wines. It is a characteristic which reminds me so much of biodynamic and organic wines, dare I say natural wines too! It certainly appeals to me.Still youthful, this is a wine which has been a big hit with friends and family when I have shared a bottle with them. Very good. 2011 – Rounder aromas, hints of cassis. Perfumed and fruity, very heady in a pleasing manner. It tastes round and full too, ripe plums and a raspberry fresh note. Liquorice with pepper sprinkling the range of flavours too. As the wine evolved in the glass there were even smoky notes emerging. Very complex, but all working well together, always lovely to drink and, yes, that fresh finish. Very good. 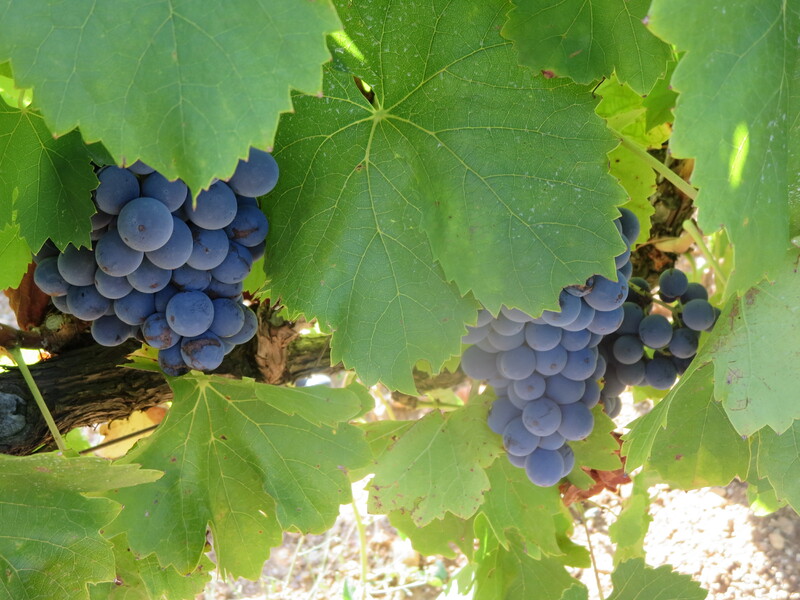 2010 – The year in which Syrah was first added to the Carignan. Fruit aromas spring out from the glass, cassis, blackberry and red fruits too, lively acidity. 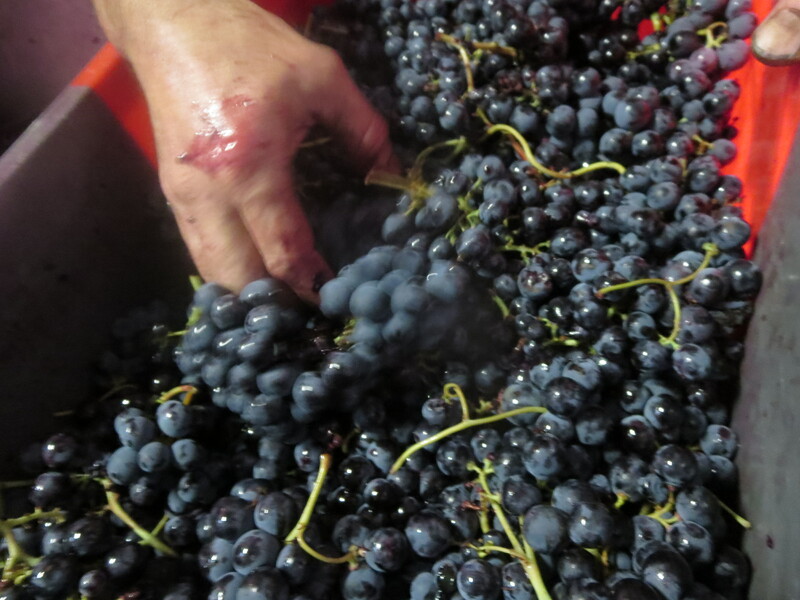 Ironically, given the blending, Carignan characters emerge, a slightly leathery, wild edge to add to the complexity. Plummy but not too fruity. No sign of being old, still very much a wine reaching its peak with a long time to enjoy it. Harmony despite all the complexity, balance and freshness, of course. Very good. 2009 – 100% Carignan. Almost restrained on the nose, the wine colour is garnet and fresh, no signs of starting to age. A wine reaching its prime but still plenty of life ahead. Pure, direct, lovely fruit with some dusty, round tannins. The acidity is still fresh but beautifully balanced with fruit profiles such as raspberry, cassis, blackberry, plums – round, ripe and delicious. Deep, complex, full. Superb. There was a noticeable lull in conversation as we tasted this wine, it stopped us in our tracks and we had to simply stop and admire, hallmark of very, very good wine. 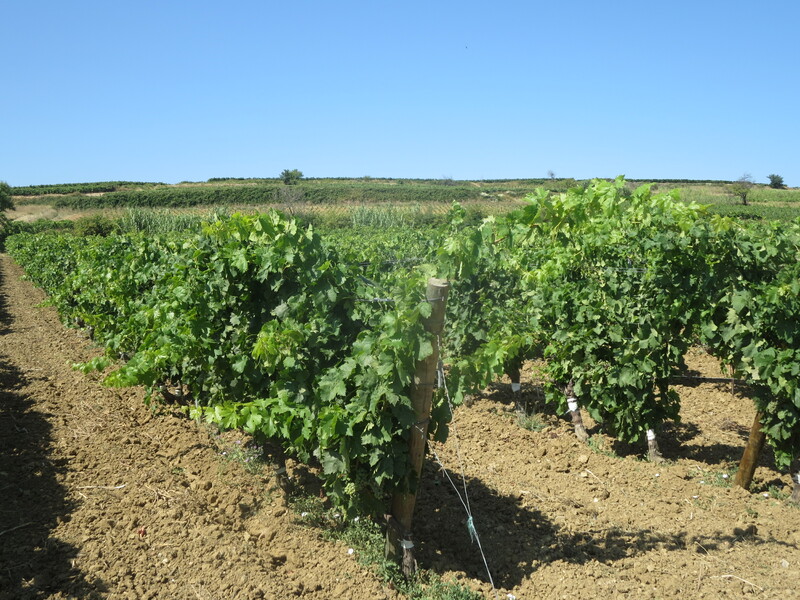 2008 – The first ever Trois Terrasses, pure Carignan. I detected a little more alcohol on the nose but nothing off putting. Soft, easy to drink with black fruits and a little gaminess, tannins still present but soft and supportive to the wine. Very much alive and kicking, it will continue to grow. I liked it, a lot, though perhaps overshadowed by the previous glass of 2009. My favourite, most peoples’ favourite, was the 2009. Joyful wine, the sort of glass which makes you realise why you find wine so fascinating and rewarding. Of the blends, I particularly like the 2010 and the 2012 but I am happy to have some bottles of all of them left. An interesting discussion followed as we compared favourites. Andrew Jefford had chosen the 08 and 09 and suggested a return to pure Carignan. 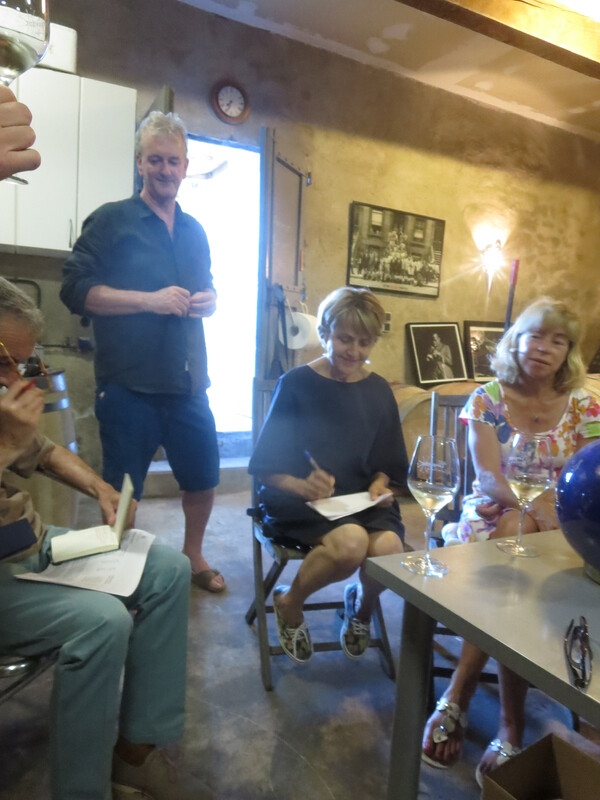 Much thought for Peter and Deborah but they must have been delighted at how well the wines all performed, worthy of anyone’s cellar, certainly in the top rank of the Languedoc. I was so pleased for them, they deserve every little bit of credit and praise. I gather the thought of a pure Carignan was already in their heads, maybe this evening will influence them. 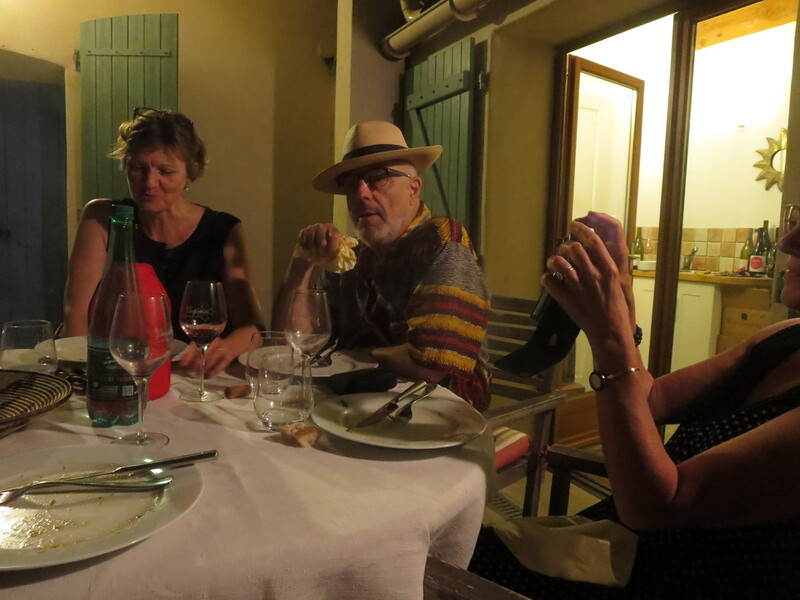 And so to dinner, made by Deborah and her friend Helen Deneuve. They even provided me with a superb vegetarian main course which was one of the best I have eaten in a long time. To accompany dinner the Cores served their Carignan rosé, Fleurs Sauvages, so popular that it disappears very rapidly out of the cellar every year, and justifiably. 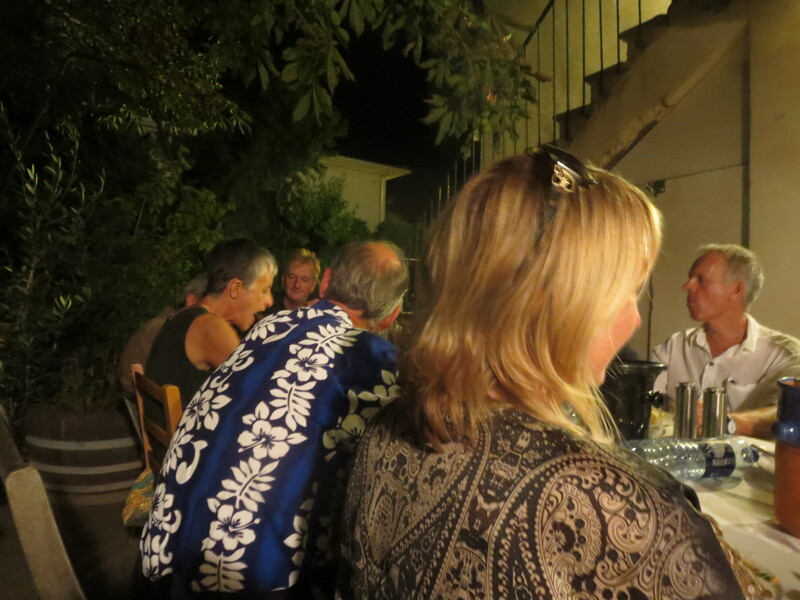 Various bottles of Clos Des Papillons and Trois Terrasses also appeared on the table to be drunk not just tasted. A fitting end to a fantastic evening. The conversation flowed, Michel entertained us royally (am I allowed to use that adjective for a Frenchman?) and then provided a beautiful Banyuls Mas Blanc 2003 to accompany a delicious chocolate gâteau. Thank you so much for the invitation Deborah and Peter, it was such a privilege to be present. There was talk of reassembling in another 5 years for ten vintages and that would be a dream. So raise your glass to Mas Gabriel, and make sure it is filled with one of their wines, you deserve nothing but the best, and so do they. Mas Gabriel website including where to buy the wines around Europe. Categories: Tasting, Vignerons, Vines, Wines | Tags: Andrew Jefford, Carignan, Carignan Blanc, Champ de Bleuets, Clos Des Lievres, Clos Des Papillons, Deborah Core, Fleurs Sauvages, Mas Gabriel, Michel Smith, Peter Core, Rosemary George, Trois Terrasses, Wendy Gedney | Permalink. The weather in the Languedoc has been a talking point, apparently it is not just a topic for us British people. No rain since June 12th, very high temperatures, 39C one day last week. Fires in the garrigue, vineyards and even towns, including our neighbouring village of Roujan. The result of this has been fissures in the ground, e.g. the photograph below in one of Jeff’s vineyards. 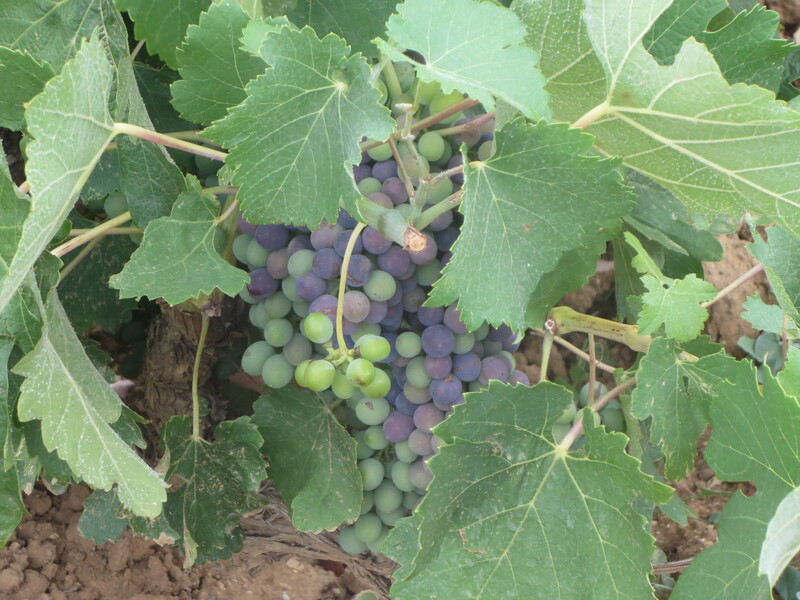 Some of the vignerons in the area have been irrigating their vines and a sign of this has been evident too. 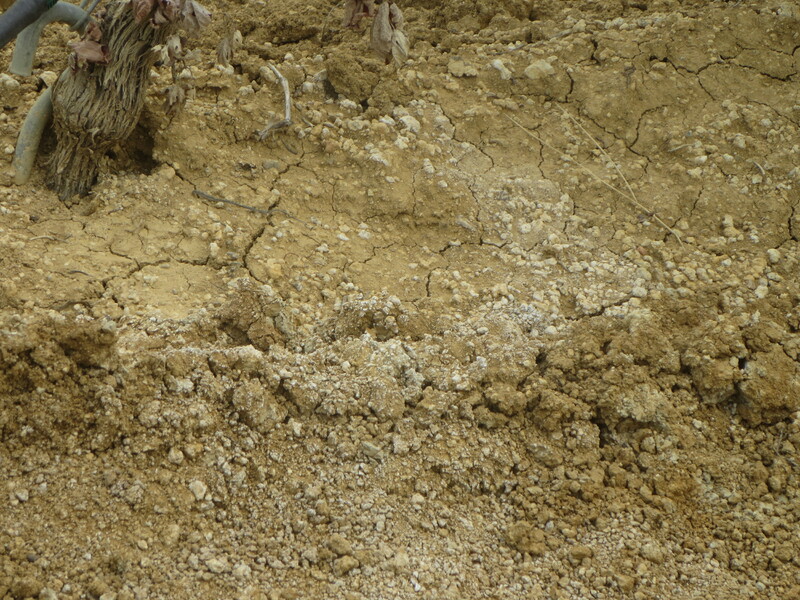 If you look at the photos below you will see white traces in the soil. 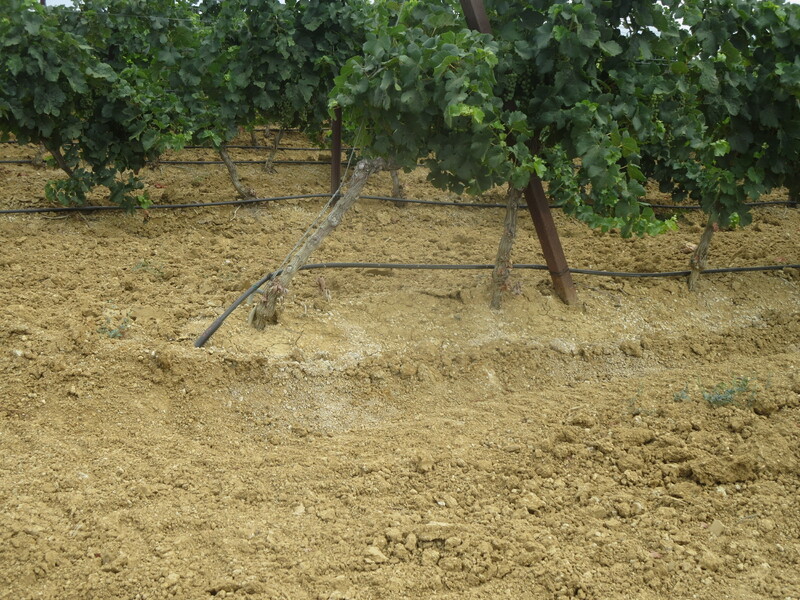 This is calcium carbonate which is a product of the water imported to irrigate the vines. In other words the irrigation is changing the nature of the soil itself. 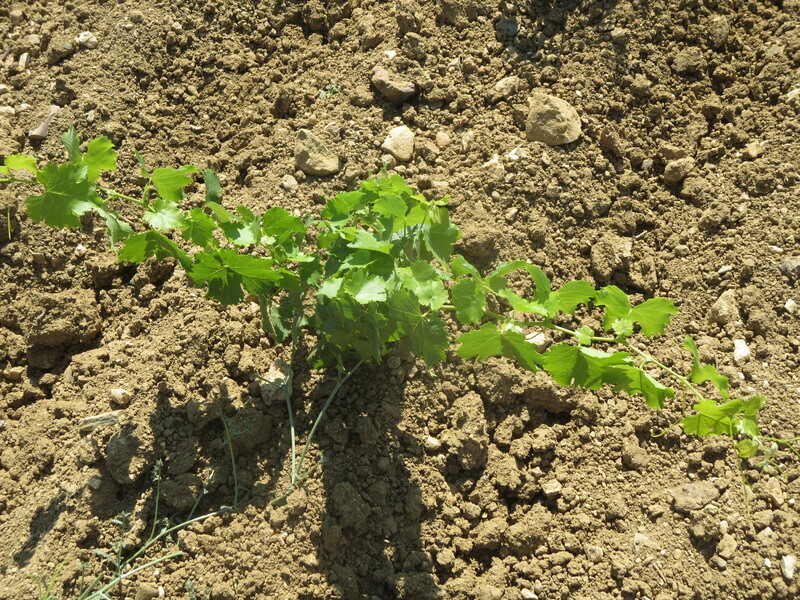 The vines themselves are remarkably resistant and strong even in the face of the lack of water. 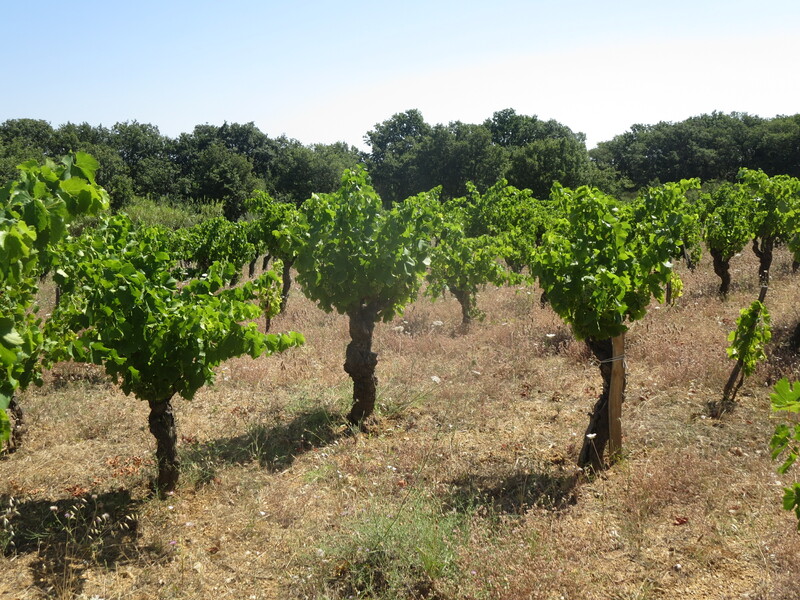 This summer is nothing unusual for the Languedoc but it builds on a fairly dry year in 2014 too. The leaves of the vines are curling in on themselves, a sign of some stress. Other problems are showing too. 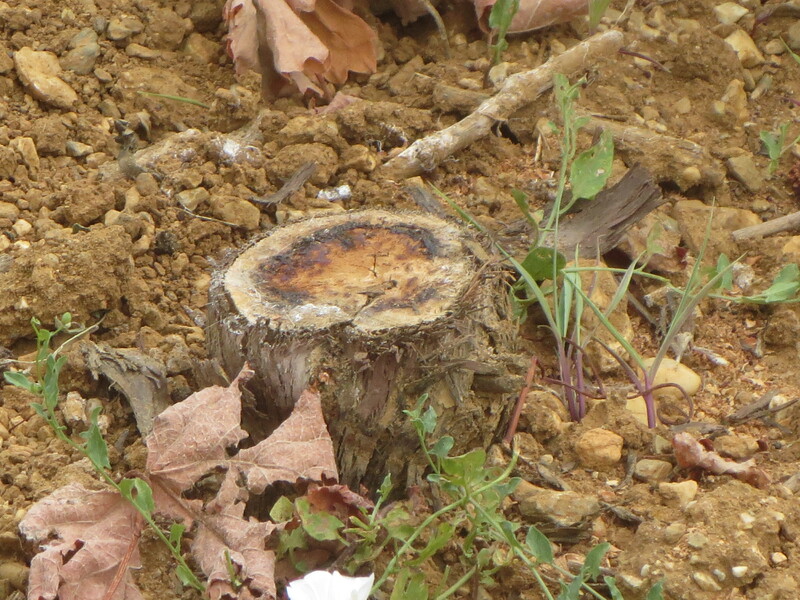 Esca is a virulent wood disease which is a major threat to the vineyards of France, working like a cancer inside the wood. 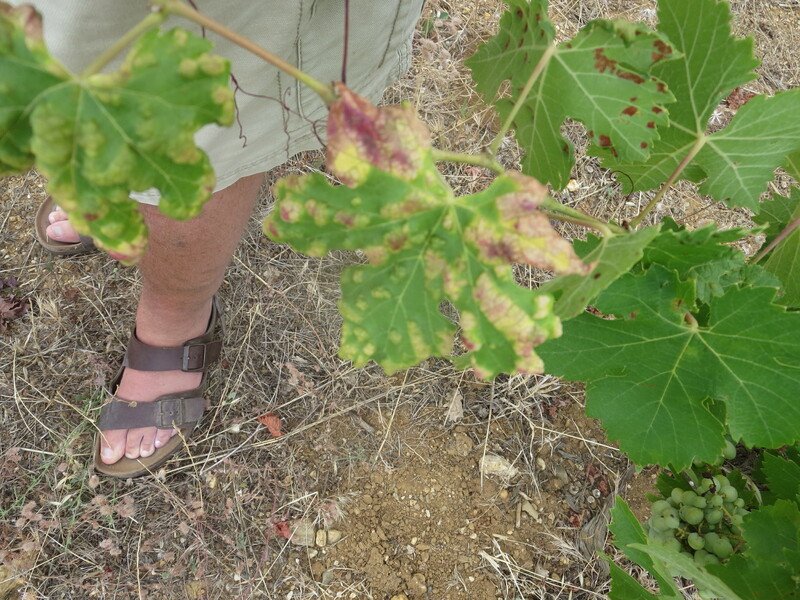 It suddenly emerges and affects the leaves and causes the grapes to shrivel and drop off. Some have linked its spread with rainy springs and higher summer temperatures, such as 2015. There is no cure, it was formerly treated with arsenic but that has, understandably, been banned. 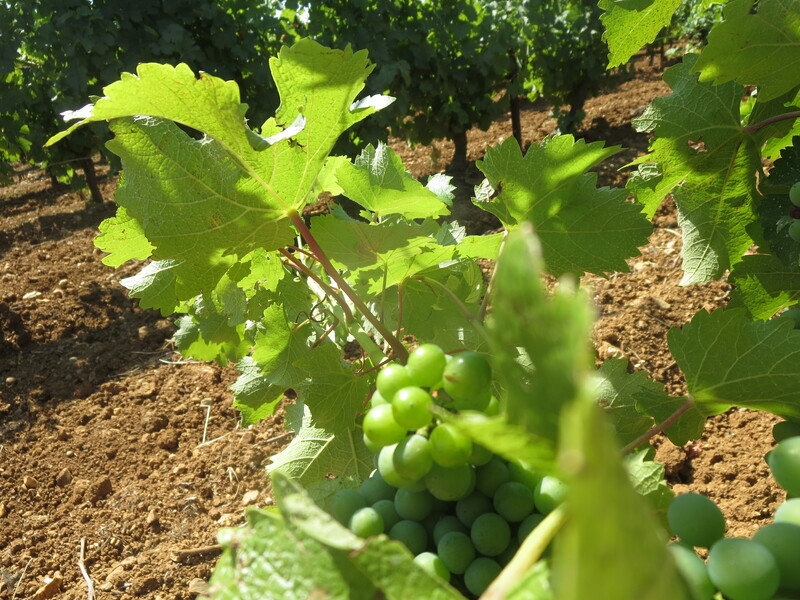 It is thought that 10 – 20% of French vines may be infected by the fungus, they have to be replaced and, of course, they take time to grow and don’t produce the same quality as older vines would have produced. One perennial problem is vers de la grappe. These are the larvae of butterflies and they grow in coccoons amongst the grape bunches, leaving a white filament as proof of their residence. They pierce the skins of some grapes causing them to be ruined. 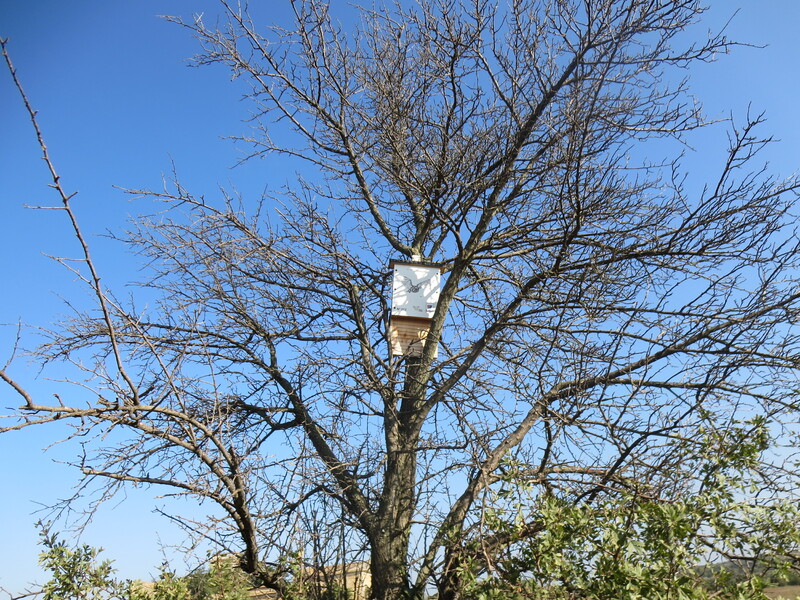 Bats and other predators eat these pests which is why Jeff, amongst others, encourages bats to live near his vines by putting up bat houses and encouraging the growth of plants, trees etc around and amongst their vineyards. 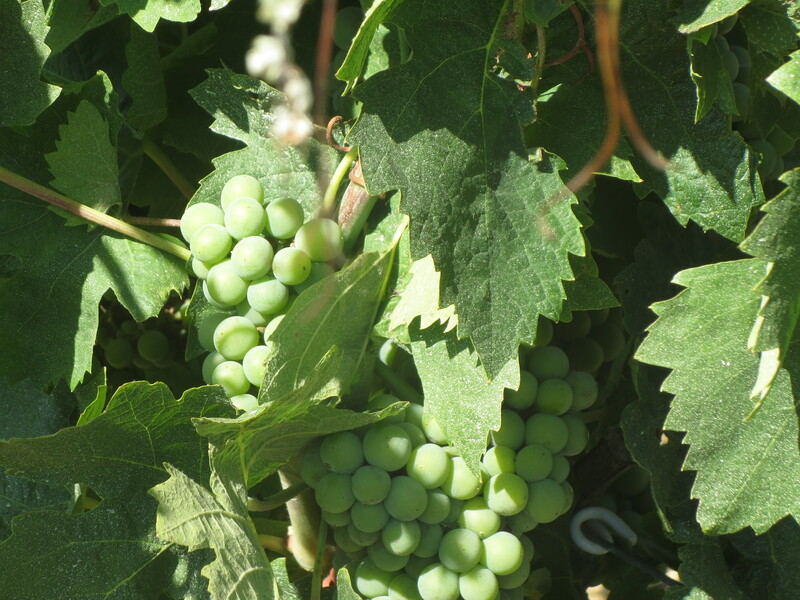 The main concern is that the lack of water will reduce yields, rain would help to swell the grapes and produce more wine. Some rain was forecast on July 22nd but in Puimisson and many other areas, none arrived. Not all bad news however. 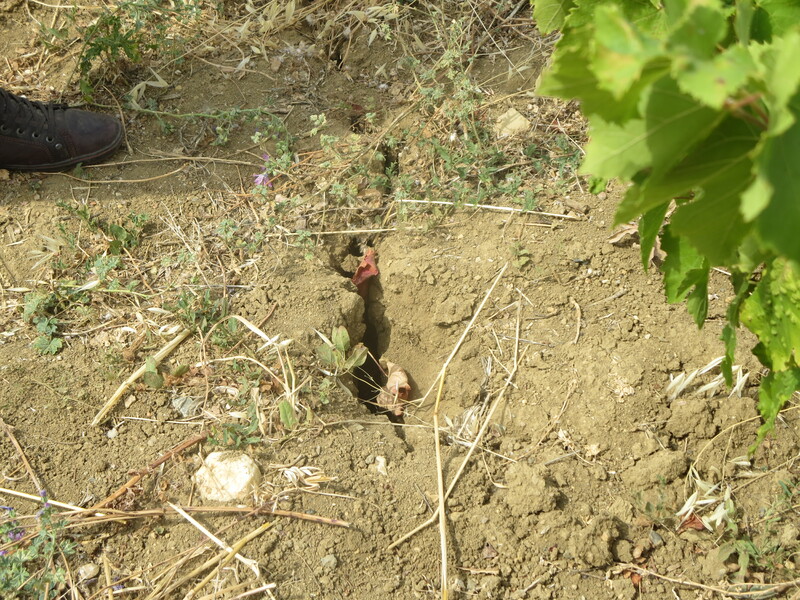 The vines are resistant and the careful management of soils, unlike the irrigated vines above, means that their roots go deep into the soil searching for water. 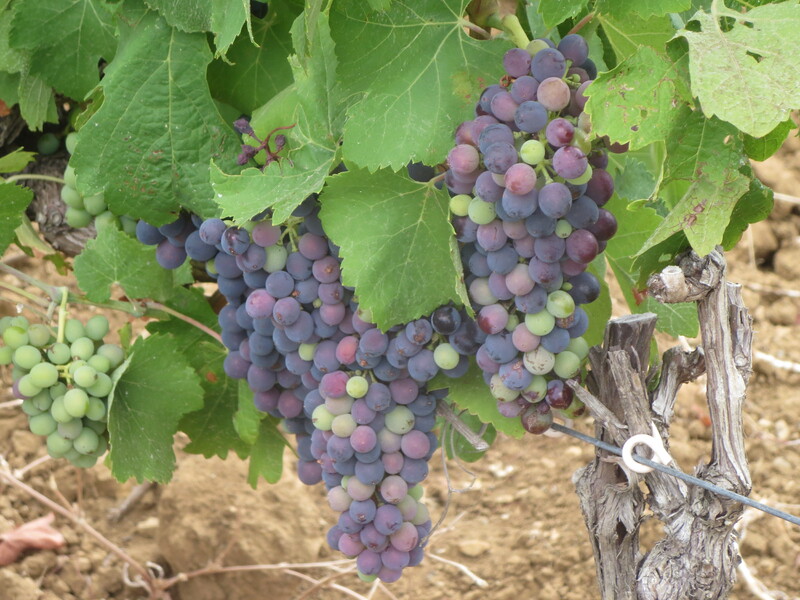 Struggling vines produce the most interesting wines. Let us hope that this is the case in 2015. 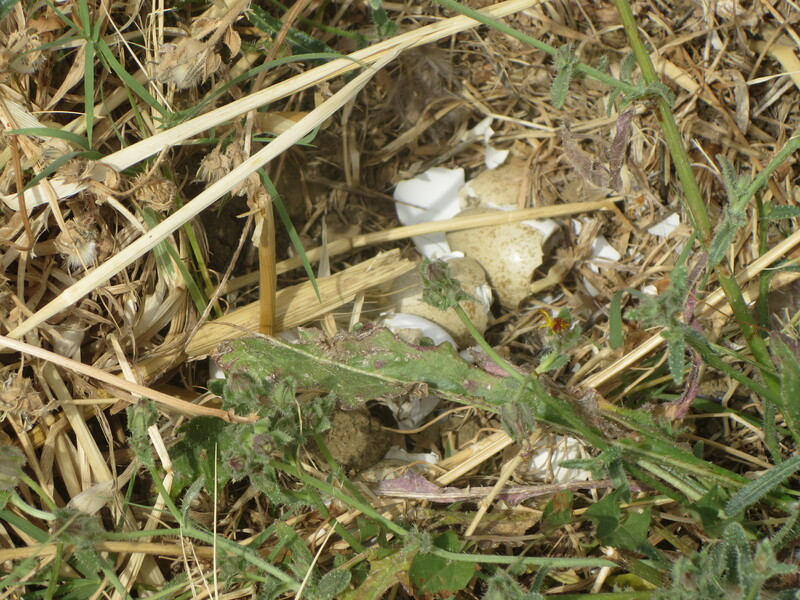 Diversity amongst the vines at Mas Coutelou continues, less than 10 metres from the fissure in the ground above were these partridge eggs which had hatched recently. And in the cellars work has begun to replace the leaky roof, which is built on timbers hundreds of years in age. 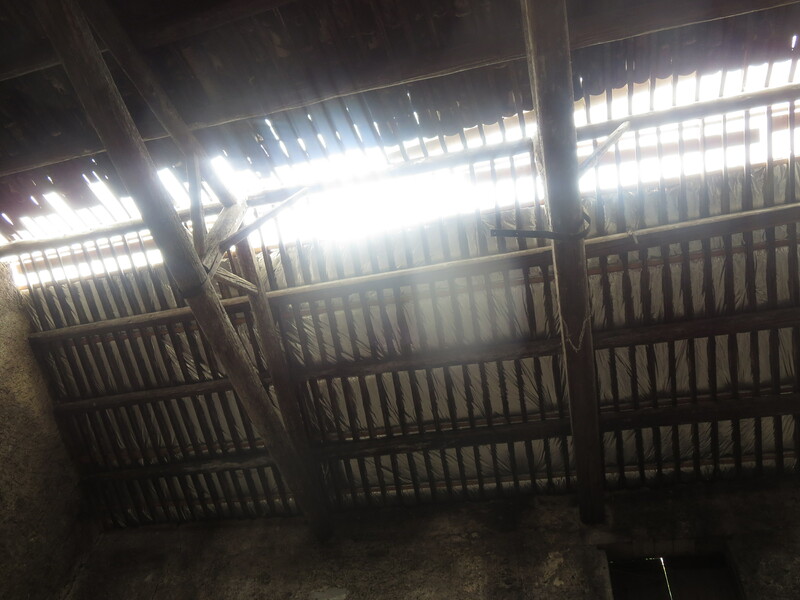 It is a beautiful roof and happily the timbers have been saved, most tiles will be recycled. 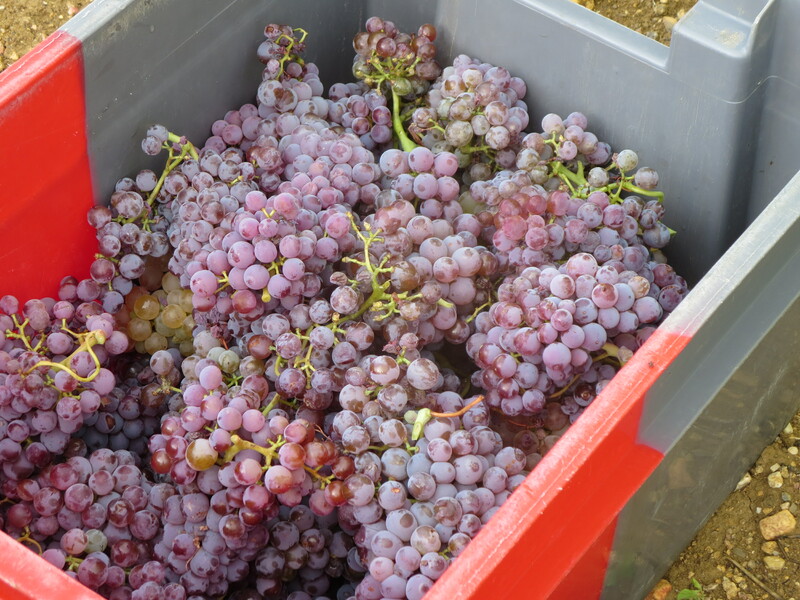 I will write more about the changes in the cellar as preparations for the vendange begin. And finally véraison is in full swing. 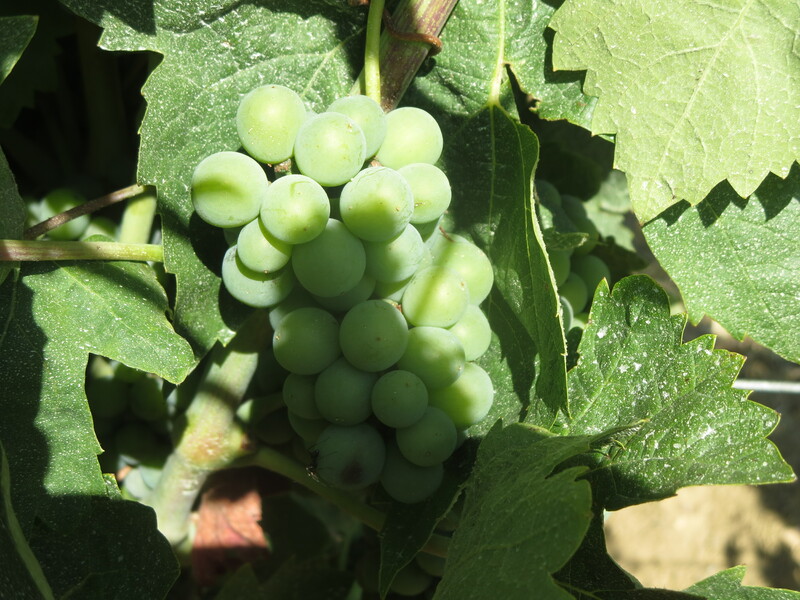 The change of colour of the red grapes is one of the key events in their development as they approach maturity. 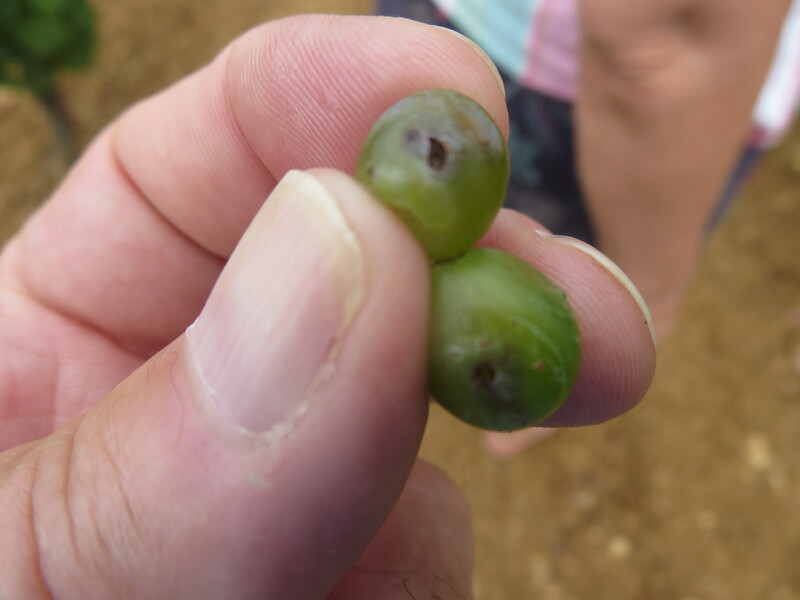 This marks the change in growth of the berries, they are now producing sugars within the grape rather than concentrating on simply growing and producing acidity. It is certainly one of the most noticeable and landmark changes in the grapes. Note the curling leaves, the vines are feeling the lack of water. Véraison and the increase in sugar levels also attracts more animals to eat them, birds, insects etc. Problems, problems everywhere. 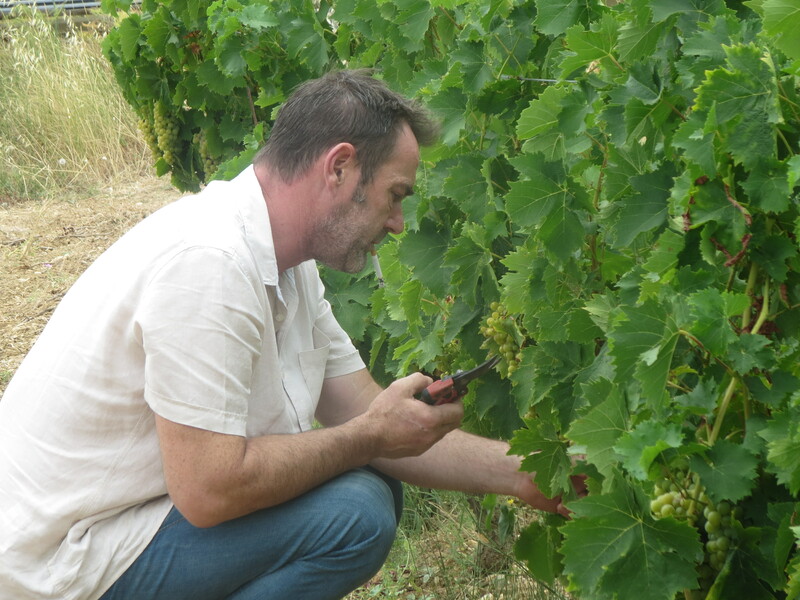 Who would be a vigneron? 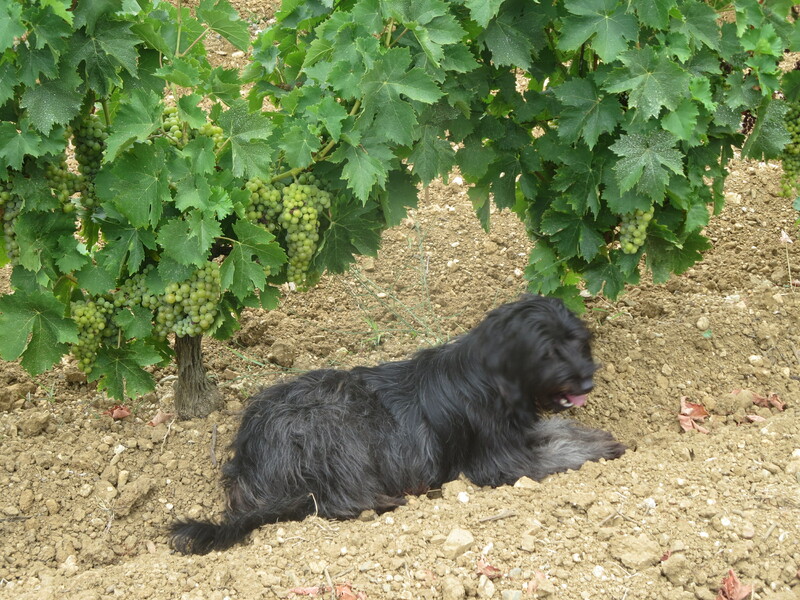 Two creatures love being in the vines for sure, me to watch their growth and, more importantly, Icare who loves to be in amongst the dirt and, in this heat, he loves the shade of the vines. 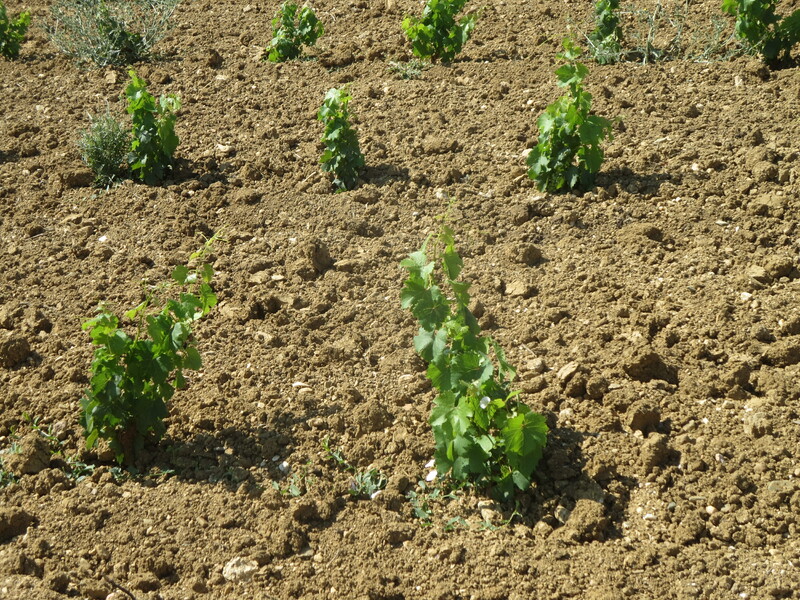 Categories: Vignerons, Vines | Tags: calcium carbonate, cave, cellar, Drought, esca, Icare, irrigation, véraison, vendange, vers de la grappe | Permalink.